What would you wish if you could wish upon a star? I think I would wish for an early spring this year. Too bad it doesn't really work. Neither do those wishes you make when you blow out your candles on your birthday cake. But that doesn't keep us from making wishes, does it? I love the look of Bermuda Bay against Basic Black and decided to use that as my main colour scheme with pops of Melon Mambo and Crushed Curry, with Whisper White. This is definitely a cheerful, eye-catching look! 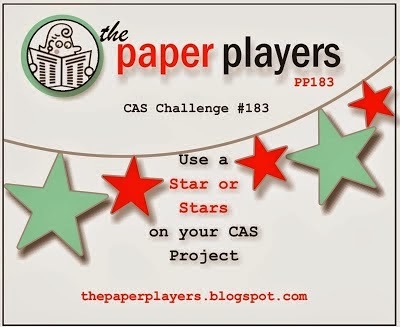 The DSP is from the Brights Designer Series Paper Stack and is a perfect background for a "starry sky"! At first, I didn't think that I had any stars to work with in my stash, but then I realized that I had a star stamp in the Perfect Pennants stamp set. I also decided to check my Label Card and Circle Card Thinlits, and I found a smaller star in the Circle Card Thinlits dies. See, there's another reason to keep a picture of all the thinlits in this set as well as in the Label Card Thinlits handy, so you can remember all the shapes they contain. Not only does the Perfect Pennants stamp set have a circle, but it also has the perfect sentiment, "Make a Wish", wish upon a star! I added a Melon Mambo flag and stamped the sentiment a second time in Crushed Curry so I could punch out the "a" using the 1/2" Circle Punch and popped it up on a dimensional on top of a Bermuda Bay star. The sentiment and its backing were die cut with Banners Framelits. The other large stars I stamped with the Perfect Pennants stamp and hand cut leaving a narrow edge of Whisper White around them. The smaller stars were just another large star stamped and the middle die cut with the thinlit star. I wanted to stamp them rather than just die cutting them out of cardstock because I wanted them to have the same quality of colour as the stamped stars. I could have stamped any solid shape and die cut with the thinlit, but the star was already inked up. Might as well stamp two as just one. The smaller stars are mounted on dimensionals and a Jumbo Rhinestone added for sparkle. Love your bright color combo....very striking card! Thanks for playing with my starry challenge this week! I think this is perfectly clean and simple! Love the bright colors and the way you've layered the stars for even more impact! Thank you for joining us at The Paper Players!